M147 | 995 m. | 3265 ft.
On the morning of 30 April 2005 Frank and I were to meet Alex and Paul at the parking where the River Falloch joins the A82 in Glen Falloch. But by coincidence both pairs of walkers had decided to buy a few provisions in the Crianlarich shop and thus we shook hands and hugged each other on the doorstep of the shop. From there we drove to the parking by the A82. The weather was fine and the sun shone for much of the day. We started the walk up the landrover track beside the River Falloch but soon left it and headed south over the open and slightly wet grassland up the slope leading to Sron Garbh. The gradient of this slope gets steeper the higher up you get but at about 700m the ridge levels off and Sron Garbh is reached. There we paused, drank some water and enjoyed the views of Cruach Ardrain, Ben More and the other hills surrounding us. Our foursome continued over the bumps of Twistin Hill to the point where the final rise to the summit ridge of An Caisteal was waiting for us. We had mistaken the rocks above us for the summit proper which is a few hundred metres further to the south. With the summit in sight we took another break to eat a sandwich and a few bisquits. Then we walked on to the summit of An Caisteal, the first Munro. After a short while we left the cairn and followed the path down An Caisteal’s south-east ridge. Here the terrain changed markedly. The hitherto grassy ridge gave way to crags and – further down – boulders through which the path weaves to the col below Beinn a’Chroin. The west face of this hill is quite steep and we could not really tell where exactly the route ahead would lead up the hill. We soon found out that the path rises over the grassy south-west slope of Beinn a’Chroin traverses some rocky steps needing a bit of handwork and then leads to the flat slabby summit plateau. Again we paused at the summit cairn to take in views (and crisps). Now all that still needed to be accomplished was the way back to the cars. At the col between the two summits of Beinn a’Chroin we took the path that heads down into Coire Earb over the north ridge ending in Stob Glas Bheag. We reached the flat floor of the glen and walked over – in places wet – grass on the left-hand side of the burn which develops into the river Falloch. After another hour we were back on the land-rover track that led us to our starting point. A good six-hour walk over surprisingly entertaining and diverse terrain. Good walk, sunshine and no rain. What more can you want? Description These two hills stand close together above the headwaters of the River Falloch, 6 kilometres south of Crianlarich. An Caisteal has a well-defined summit at the junction of its north-west and north ridges, the latter being known as Twistin Hill.To the south it drops to a col below Beinn a'Chroin. This hill has a one-kilometre long summit ridge with the highest point at the east end and another cairned point 500 metres to the west of nearly equal height.The traverse of the two hills from Glen Falloch starts at a carpark beside the A82 road near the bend in the River Falloch. Follow a track over the river and climb the grassy slopes of Sron Gharbh. Continue along the ridge, Twistin Hill, over a rocky knoll to reach the summit. 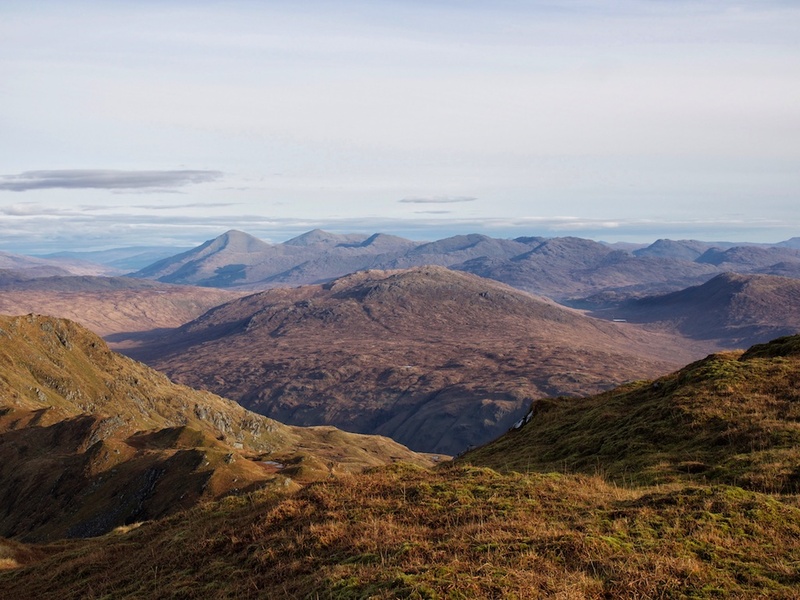 Descend south to the col and climb to the west end of Beinn a'Chroin's summit ridge. Continue along this ridge to the summit. The descent goes north down to Coire Earb and along the left bank of the River Falloch to return to the day's starting point.